While diligently plugging away at refining Zotero’s syncing features, Team Z found itself adding such a massive amount of new functionality that the software required nothing less than a whole new version number. Also, Firefox was doing it. Most important among the new features is the long-anticipated ability to collaborate in groups and group libraries. Groups provide a powerful way to share collections with a class, work closely with a colleague on a project, keep track of conversations in your field more broadly, and keep tabs on what people at your institution or in your department are working on. To copy items into any of your groups just drag and drop items from your library into any of your group libraries and subcollections. 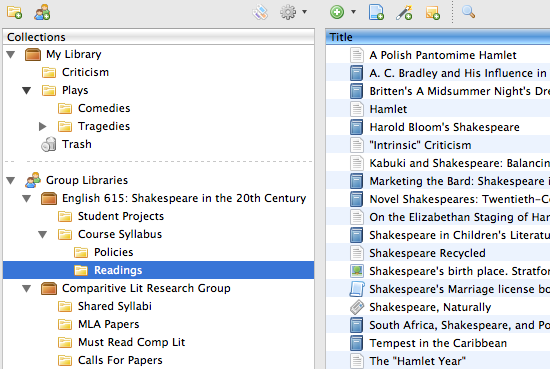 Below you can see an image of your groups inside Zotero. Every group also has its own web page. For public groups, this page acts as a public portal for the group’s collaborative work. For private groups, the page offers a way for group members to interact with the group’s collections from anywhere. 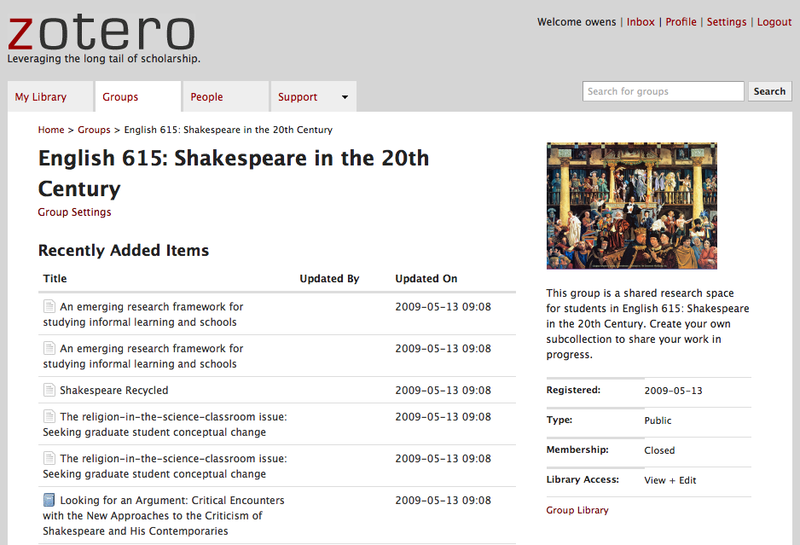 Zotero 2.0’s group abilities transform an already powerful personal research tool into a collaborative platform for research. As we refine this beta release, the Zotero team will roll out its recommendation engine, a storage solution for sharing attached files, more ways to navigate through collections online, and the ability to view feeds from public groups and libraries. Download Zotero 2.0 today! This entry was posted on Thursday, May 14th, 2009 at 5:33 pm by Trevor and is filed under News. You can follow any responses to this entry through the RSS 2.0 feed. Both comments and pings are currently closed.